X-Plane 11 Aeroworx Douglas C-47 Dakota Beta 2.5. The Douglas C47 is a twin-engined low wing transport aircraft, powered by Twin Wasp R1830-90C engines. Between 1935 and 1947 Douglas built a total of 10,654 of the type and over 80 years later there are still almost 1,000 in flying condition. This magnificent aircraft was originally designed by Manfred Jahn, Jan Visser and Team and is being flown by hundreds of happy users. 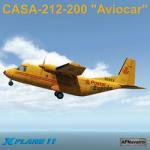 At the end of July, Aeroworx obtained the permission to port this aircraft to X-Plane. As members of the South African Airways Museum Society, we have direct access to their C-47 and also a few other DC-3/C-47's. Getting good photographs is no problem, the crews flying and maintaining these aircraft are also extremely helpful in providing us with documentation, advice, etc. This aircraft features a fully 3D vintage virtual cockpit, with dozens of mouse click-able animations. The Sperry is the primary autopilot, but for the more "modern" guys, a G530 is available as a pop-up. This is a public beta version, PLEASE read the "Release Notes" attached to the download. By Aeroworx (Johan van Wyk and Fred Stegmann). X-Plane 11.30+ Douglas F3D-2 Skynight 1.0. The Douglas F3D Skynight is an American twin-engined, mid-wing jet fighter aircraft manufactured by the Douglas Aircraft Comany in El Segundo, California. The F3D was designed as a carrier-based all-weather night fighter and saw service with the United States Navy and United States Marine Corps. The aircraft presented here is an aircraft of the Marine VMF(N)-513 squadron VMF(N)-513 Flying Nightmares. Credit goes to Beber for the use of his pilots. By Philippe Gastebois. X-Plane 11.30 Supermarine Spitfire MK 1A 1.1. I'm currently working on this Spitfire MK 1, but it's a huge job and I'm not sure I have the courage to finish it by myself. If somebody would like to help me with the animations, I would be really interested and grateful. If you feel you can't help with the animations, I would still very much like to hear from you, as I would like to know your opinion on the appearance of the aircraft and also the flight dynamics. Please use the comments section below. Thank you. By Stephane Toledo. X-Plane 11.25+ Horten Ho IVa High Performance Glider 1.0 The Horten Ho IV was a high performance, all wing, competition glider designed to compete with the best gliders of its time. It featured a high aspect wing for optimum gliding performance and a prone pilot position, minimizing drag while providing a unique flight experience. 4 were built in the 1940s and one was used in competitions in the 1950s (taking prizes a number of times). This X-Plane model features: highly accurate model based on historical, research and restoration data, full flying wing aerodynamic model using original Horten airfoils, a bell-shaped lift distribution and custom fuselage airfoils to model the entire aircraft for a realistic flight experience, custom airfoils analysed with X-foil across the Reynolds number regimes of the aircraft, custom flight controls using X-Plane's override_control_surfaces feature to simulate the triple differential elevon and dual drag/dive brake control surfaces of the Ho IV design, plus many more additional features. Documentation included in the package. By Fred Highland. X-Plane 11.30+ Dassault Mirage F1CT 3.0. The Dassault Mirage F1 is a French fighter and attack aircraft designed and manufactured by Dassault Aviation. Powered by a single SNECMA Atar 9K-50 turbojet engine, which provided about 7 tonnes-force (69 kN; 15,000 lbf) of thrust, and armed with an array of French and American-sourced armaments, the Mirage F1 has been operated as a light multipurpose fighter and has been exported to around a dozen nations. The Mirage F1CT is a ground attack version of the Mirage F1C-200. Following their replacement in the air defence role by the Mirage 2000, the French Air Force had a number of surplus Mirage F1C-200s, and in 1988 it launched a conversion programme to turn these aircraft into interim ground attack aircraft to replace elderly Mirage IIIEs and Mirage Vs. Credit goes to Beber for the use of his pilots. By Philippe Gastebois. X-Plane 11.25+ Grumman F9F-5 Panther 1.1. The Grumman F9F Panther is one of the United States Navy's first successful carrier-based jet fighters, as well as Grumman’s first jet fighter. A single-engined, straight-winged day fighter, it was armed with four 20 mm (0.79 in) cannons and could carry a wide assortment of air-to-ground munitions. The Panther was used extensively by the U.S. Navy and Marine Corps in the Korean War. The aircraft presented here is an aircraft of VF-122 squadron assigned to USS Oriskany and took part of the Korean War. Credit goes to Beber for the use of his pilots. By Philippe Gastebois. X-Plane 11.25+ Lockheed C-5B Galaxy 1.0. The Lockheed C-5 Galaxy is a large military transport aircraft originally designed and built by Lockheed, and now maintained and upgraded by its successor, Lockheed Martin. All credit and kudos goes to the original author of this C5 aircraft, Carlos Lopez Garcia (carlopg), who did all the work. This updated version simply adds X-Plane 11 compatibility plus an updated cockpit and instruments. There are also a couple of battle tanks in the main cargo hold. These can be revealed from both the front and rear loading doors (shift-F1 and shift-F2 respectively). Note: these are the default keyboard assignments. By Gary Hunter.